Love nothing more than snuggling up with a western or cowboy romance? You’ve found the best place to start! 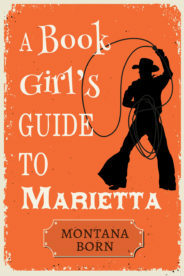 A Book Girl’s Guide to Marietta includes everything a book girl needs to know about Tule Publishing’s most popular town for love, Marietta, Montana. Starting with an exclusive foreword by founding Tule author and USA Today Bestseller CJ Carmichael, you’ll get insight to the history of Marietta, a map and guide to all of the key locations in town, an overview of every series and how their characters are connected, delicious recipes straight from the kitchens of Marietta residents, and much more! Whether you’ve loved Marietta from the start, or are brand new to town, this guide is a must-have for every Marietta romance reader! Creating a fictional town is one of the joys of being an author and the fun is magnified when the creative process involves a team of highly imaginative and talented writers. When Jane Porter, Megan Crane, Lilian Darcy and I sat around the kitchen table at my cottage on Flathead Lake, Montana, in May of 2013 our goal was to invent a locale for the connected rodeo stories we planned to write. We drew maps, we hammered out details, and we researched real Montana towns and history to make our town feel as authentic as possible. Important town landmarks were fabricated: local bar Grey's Saloon, Sage Carrigan's Copper Mountain Chocolates, the historic Graff Hotel and the tragedy-steeped River Bend Park. Once we had our town of Marietta, Montana, we started writing about the people who live and love there, books that Tule Publishing branded Montana Born. I don't think any of us could have guessed back then how our readers would grow to love our town, how they would clamor for more stories, how they would wish they could visit or even move to Marietta themselves. Over time more and more talented authors have written stories set in Marietta. The town as grown, and with each new story family trees are expanded and entwined. This book is a guide, for new readers and old, to enrich their Montana Born reading experience. On behalf of myself and the other founding authors of Marietta—Jane, Megan and Lilian—and the publishing team at Tule, I hope you enjoy your visit here.